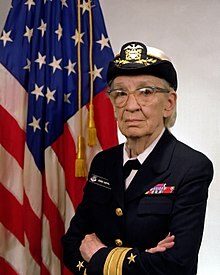 Grace Brewster Murray Hopper (née Murray December 9, 1906 – January 1, 1992) was an American computer scientist and United States Navy rear admiral. One of the first programmers of the Harvard Mark I computer, she was a pioneer of computer programming who invented one of the first linkers. She popularized the idea of machine-independent programming languages, which led to the development of COBOL, an early high-level programming language still in use today. Prior to joining the Navy, Hopper earned a Ph.D. in mathematics from Yale University and was a professor of mathematics at Vassar College.